In the box: Stir fried mee tai mak, nuggets, fishballs & orange. Love all these wonderful picks! 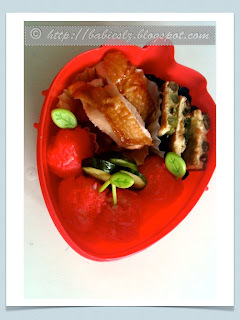 Whenever I have no idea what to do for the bento, these picks comes in handy. I think they look like chicks! My dear Z told me earlier this year that he hope to get all 4 badges: Attentiveness, Responsibility, Obedience and Gratefulness. I'm so proud that he got his 3rd badge today! 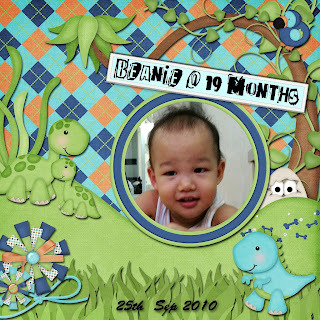 ♥ Beanie loves music! He often climbs on the piano chair and play on the keyboard. 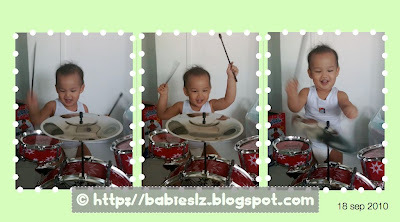 Recently I bought him a drum set and he enjoys it too! 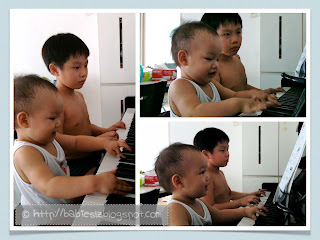 He will probably request to learn musical instrument when he is older, just like his brother. 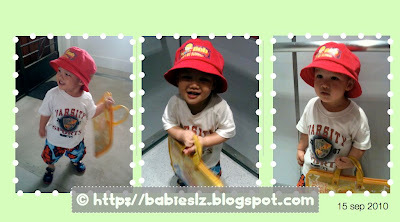 ♥ He grabs hold of anything near him and starts showing us funny sides of him. 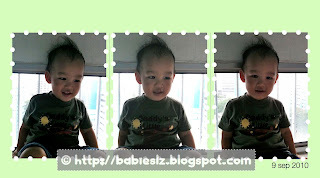 ♥ His favourite spot in the house would be sitting by the window in our bedroom. He enjoys looking out from the lower window. 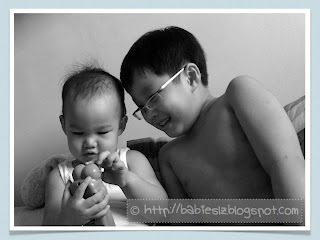 ♥ He loves to help not only me but his siblings too. He usually helps to carry their bags especially Z. 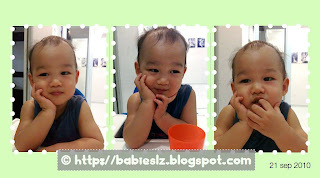 ♥ Lately, he likes to pose like this! My little vain pot! I have lots of pics of him posing this way. 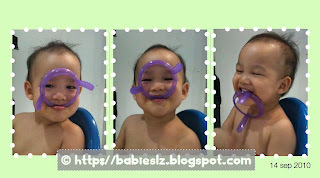 ♥ Pretend/role play is something that he enjoys most now. 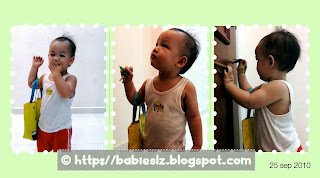 He puts his stuffs (toys/books etc) into a bag and pretends that he is going out. L finally completed her group project and today the teacher organised a picnic by the beach for the whole class, each group will bring their own food. 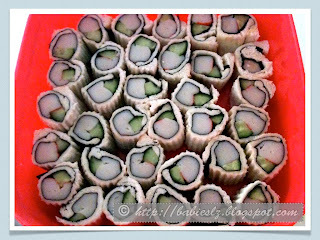 My dear girl, suggested to her group that her mommy will make sushi sandwiches for them! Woke up very early this morning to prepare these for the kids and I'm so glad all of them (from her group) like it. She told me other classmates asked for it too but I prepared only enough for her group members. In the box: Baked soya chicken, fried egg with beans & rice. I recently bought a few cans of food color sprays and don't know what to do with it. Today, I tried it on the rice, managed to make a few cherries look-alike and not too bad but kind of messy though when handling it. Glad that I put on plastic gloves. My girl guessed that those little red thingy were cherries! Yay! "Mommy! 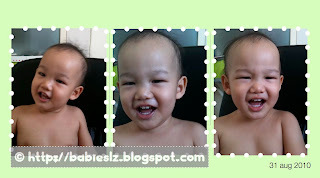 When are you going to buy lanterns for us? 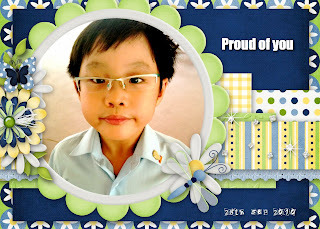 You know, mooncake festival is coming soon?" ...... My kiddos have been 'nagging' at me to get them lanterns and so, last week I bought each of them one. I wanted to get those traditional lanterns (using candles) but daddy doesn't like the idea of his kids playing with fire. 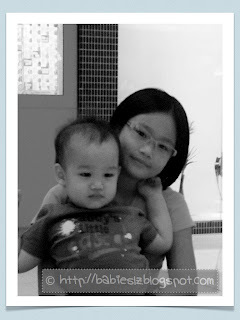 L & Z took quite awhile to choose what they want but not Beanie! He is 'crazy' over SpongeBob (or any character with the name BOB. Haha... ) that he chose Patrick instead of Mickey Mouse. 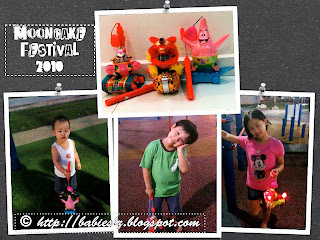 In the evening, I brought the kiddos down to the playground and had fun with their lanterns. I'm sure you know how 'noisy' it is with these new lanterns! Haha..... I have not one but THREE! So tempted to remove the batteries but I gave up.... They were so happy playing with it. L & her best pals since nursery, Rachel & Charmaine. 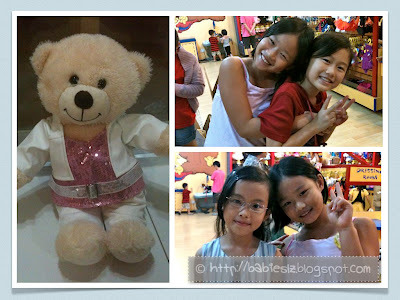 Pics was taken today at Charmaine's birthday party and she got a bear! She declares that from now on the bear will sleeps with her. In the boxes: chocolate bread, nutella bread, grapes & rapsberries. 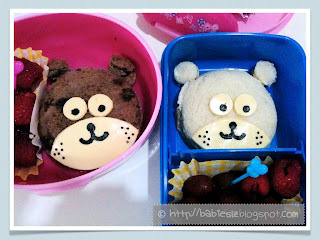 I seldom prepare cute bento for their recess nowadays... Feel bad about it so today I made 2 'cute' bears for them. Simply can't get up early like I used to, night time is the only time that I can have some ME time to log on to my computer to play games or serve the net... That is if I finish my chore (ironing) fast. Forest Adventure @ The Mall?! 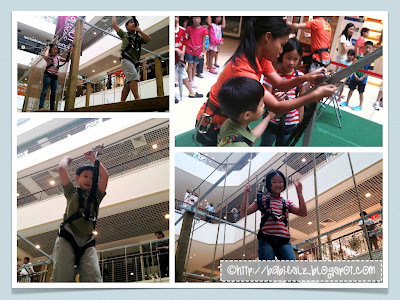 What a surprise to see Forest Adventure in the mall! 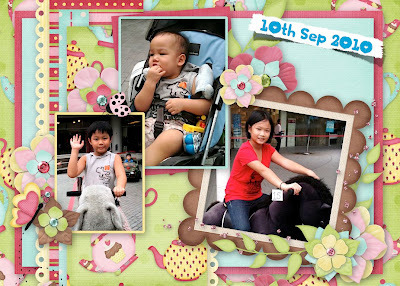 A mini 'adventure' for my kids! Z did the 'real thing' once when he attended his friend's party but not for L. No crowd at all till my kids about the complete it. 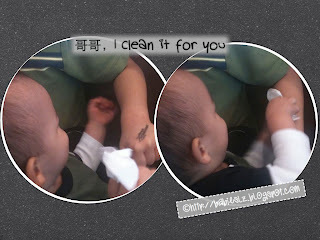 While we were having our KFC breakfast after the 'adventure', Beanie noticed a 'stain' (it was a stamp from the adventure) on 哥哥 hand and tried to clean it for him. How sweet! 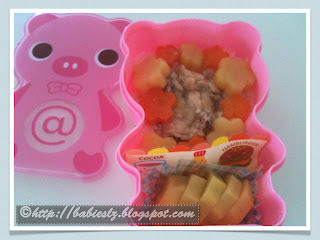 In the box: Chicken stew, rice & golden kiwi. My kids fav! Chicken stew! 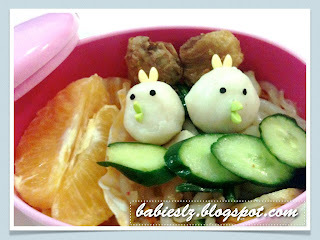 This is one of the dish that they often ask for.